UPDATE: Due to Thursday's rain forecast, tour will be Monday, September 14th at 5:30 pm. Grab your walking shoes or bike and join Boston Redevelopment Authority staff for a tour of the Dorchester Avenue study area to continue the dialogue about priority items that the Dorchester Avenue Corridor project plan can address. Both tours will leave from the parking lot at 195 Old Colony Avenue at 5:30 PM on September 10th. Participants should register for one: either the walking tour or the bicycle tour. Register now. Please check the project website for updates on weather-related cancellations.Rain date will be September 14th, 2015 at 5:30 PM, departing from 195 Old Colony Avenue. 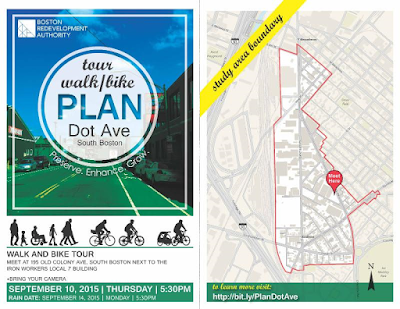 What to learn more about the Dorchester Avenue Corridor project? Read this related article.